Members of New Castle United's U14 team celebrate its CSA cup champioship last weekend in Grand Junction. Loveland played host to the 2017 Professional Rodeo Cowboys Mountain States Circuit Finals, held at The Ranch Events Center Oct. 26-28. Among the top 12 Women’s Professional Rodeo Association Mountain States barrel racers was Rifle’s C.J. Vondette. Vondette, the 2014 Mountain States Circuit Finals year end and average champion, earned her fifth qualification to the circuit finals as a barrel racer. Oct. 26’s first round of rodeo action saw Vondette finish in a three-way tie for fifth place aboard the gelding named Merada’s Dual Stich with her time of 15.45 seconds. During the second round, Vondette earned a check for $1,343.29 with her second-place finish and time of 15.31. Wrapping up competition with an eighth-place finish in the third go round, three solid runs secured Vondette a check for $1,343.29 for her third place average win. The Mountain States Circuit Finals prize money counts toward 2018 professional rodeo standings; Vondette’s paychecks in Loveland moved her solidly into 35th position in the world standings, and in the top 5 of the circuit standings. Next up on Vondette’s professional rodeo agenda will be the National Western Stock Show and Rodeo held in Denver in January. 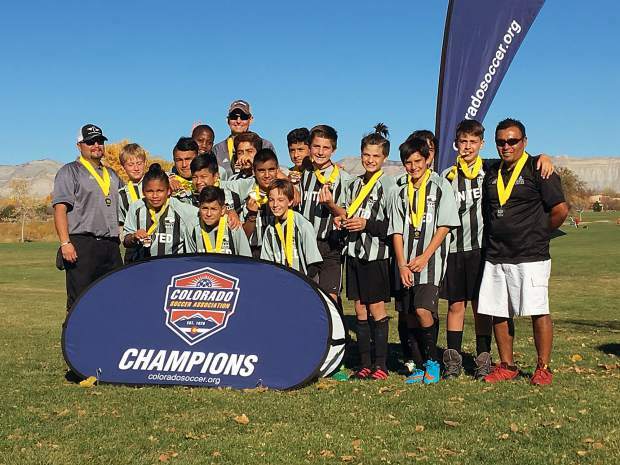 The New Castle United boys U14 soccer team, coached by Fil Meraz, Mario Chamorro and John Wilski, won the CSA cup in Grand Junction last weekend. The team played for their teammate, Francisco Hernandez, who was seriously injured in a tragic car accident. Team members include Jonathan Lovelace, Joshua Chamorro, Alexis Serna, Blake Huskey, Brian Saenz, Joseluis Prado, Filiberto Meraz, Sammy Chamorro, TJ Campbell, Tito Galdamez, Anwar Beltran, Mario Pinedo, Jacob Wilski, Tyler Parker and Eddy Garcia. Head up to the Glenwood Springs Golf Course on Thanksgiving Day morning at 10 a.m. to compete in the annual Turkey Day 5K Fun Run around the course, starting at the clubhouse in the morning and ending at the clubhouse. Pre-registration is $15, but runners must sign up before Nov. 21 at 5 p.m. Runners may sign up at Summit Canyon Mountaineering, Defiance Strength & Conditioning, or Independence Run & Hike, as well as with any member of the Glenwood Springs High School swim teams, or any member of the Glenwood Springs High School cross country team and any member of the Sopris Barracuda swim team. The cost of registration on the day of the race will jump to $25. Race-day registration and bib pick up will begin at 8:30 a.m.
New to the race this year is the online registration at active.com. The race begins promptly at 10 a.m.